Taking the stress out of packing! Constant travel and living out of a suitcase for over a year has taught me so much about myself and how I want to live. Minimalism is now me; being around to much stuff stresses me out and just doesn’t feel good to me. Like most Americans I had a house full of furniture, and lots of things filling every corner and covering the walls. Even when I began this journey I purchased a larger suitcase because I couldn’t fit everything I needed into the one I had. On the first plane right to Thailand I had a suitcase, a day back pack, and a larger backpack. A year and 2 months later, I am down to a bag for my computer and a medium sized suitcase. Down sizing has taught me that I don’t need as much as I thought. Unless you are trekking through the untouched jungles of the Amazon, you can find pretty much what ever you need throughout the world. 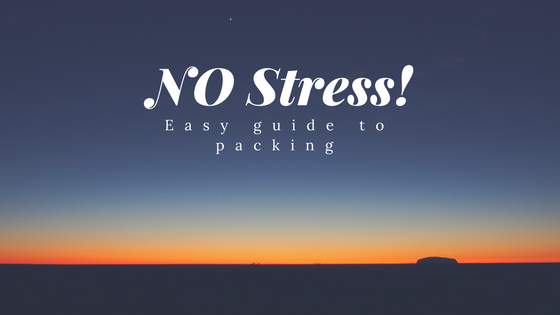 Packing for a trip can be stressful but it doesn’t have to be. Pro tip, pack what you think you will need, then unpack those items. Next cut the number of items in half. This will save you money on baggage fees and I promise you will feel better while traveling. The way I pack is based off of two words: comfort and layers. Comfort is key to having a good trip. Some people can walk around Rome in high heeled shoes. I am not that person, I would end up in the ER with a broken foot or ankle. My comfort level is flat shoes, leggings, and loose fitting shirts. But if you are comfortable in tight dresses and high heels more power to you! Besides comfort, wearing layers is a lifesaver! When I was in Scotland there was a beautiful wool sweater that I was dying to buy. I thought about it for a good 30 minutes and then logic kicked in. This sweater weighed about 2 lbs, and was bulky; there is no way shlepping this piece of clothing around the world made sense; I am currently in Puerto Rico where it is 80 degrees, I would be kicking myself if I had that sweater taking up room in my bag. Keeping it simple with layers will make you a happy traveler, especially on those days when you begin early in the morning and it’s still cool out but later in the day the sun is beating down on you, and you can’t take off enough clothing. Take the stress out of travel, pack smart, and enjoy your journey. If you are still stressed out about packing and travel, get in touch with me. I can certainly help answer questions you may have. Until then, happy travels! May we meet in the middle one day. Need help packing for your next adventure? Here are some thoughts and tips on how to make it easier. Newer PostClearing up the confusion on extended EU travel!